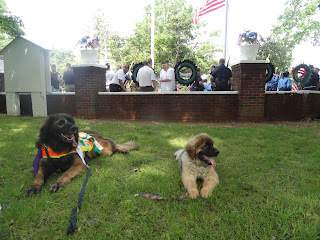 Events & Blog: MR. AMERICA THE PUPPY LEONBERGER LEADS THE MEMORIAL DAY PARADE WITH CHEWEE!!! MR. AMERICA THE PUPPY LEONBERGER LEADS THE MEMORIAL DAY PARADE WITH CHEWEE!!! Yesterday on Memorial Day, the Village of East Rockaway had a fantastic parade to celebrate what our War Veterans have given up in their lives to protect our way of living. Little Mr America and Chewee lead the parade down Main Street and into Memorial Park. A beautiful ceremony was held and a 21 gun salute was given. It was a proud day and here are the boys taken a moment of rest after a long walk in the hot sun. Everyone had a great time and then celebrated with a BBQ afterwards. Chewee meets WPLJ's famous COOPER LAWRENCE!! !